Because while I may be ready to move on with most things in my life, I want you all to still come with me! p.s. 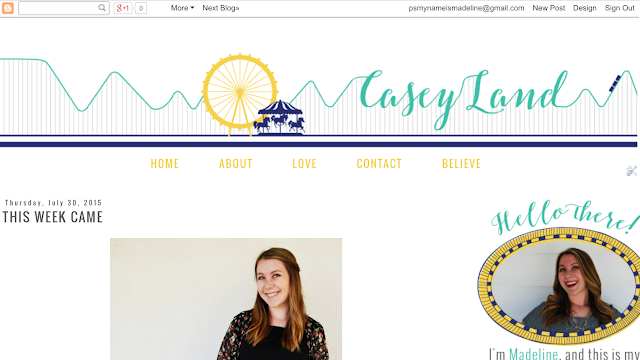 see how cute my new blog is? You can get a beautiful new design too! But you have to come over to Casey Land to find out how! Anyway, I picked the routine of looking at a fridge and a pantry full of food, and not feeling super into anything that is in there. Am I the only person who does this?? What the FLOG challenge is: here. 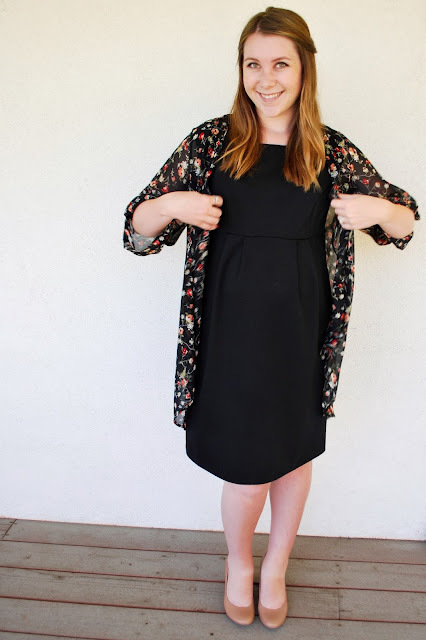 Link up this week: here. You should all do it! I love watching everyone's videos! Just take a moment to enjoy my saltwater sandals tan lines and my swollen pregnant ankles. Just a moment. And then we can move on and never speak of it again. If you asked me a few months ago if I ever thought this week would come, I would have said, "yes." Because I am realistic and obviously time is going to pass and weeks are going to come. BUT if you would have asked me a few months or even a few days ago if I was ready for this week to come, I would definitely have said, "No!" First of all, I'm 33 almost 34 weeks pregnant... WHAT. Second of all, Alex Casey has driven away in a 24 ft Budget Truck carrying all our possessions including my Snoogle! (Body pillow, for those of you who haven't read about it before.) Oh my gosh, saddest day of my life. I mean, I know that we will be seeing each other again but it just seems so far away. I hate it. I thought I would be fine with staying behind for a little while, but 89% of me wishes I had climbed in that truck with him. Why am I waiting, you ask? I don't know if I've ever answered that question, but if I haven't here's the scoop. My second lil sis Olivia comes home from her mission to Baltimore, Maryland in two weeks. When Alex and I decided to move to Indiana one of the first things I asked him was, "What about Olivia??" In the end, I decided to stay behind for a few weeks to see her and hang out before I leave. I haven't seen her in 18 months, and I didn't want to move across the country without seeing her for even longer. It seemed like a good plan at the time, and I am still excited about it, but there are still two weeks of NO Olivia and NO Alex that I have to get through. Thankfully I have my mom, dad, and brother to entertain me. Anyway, if you haven't seen my first video, click here. If you want to know what the FLOG challenge is, click here. If you want to link up and participate this week (YOU SHOULD!!!!) click here. Ok, thank you guys so much for pretending to like my video! ;) It was a real self esteem booster. 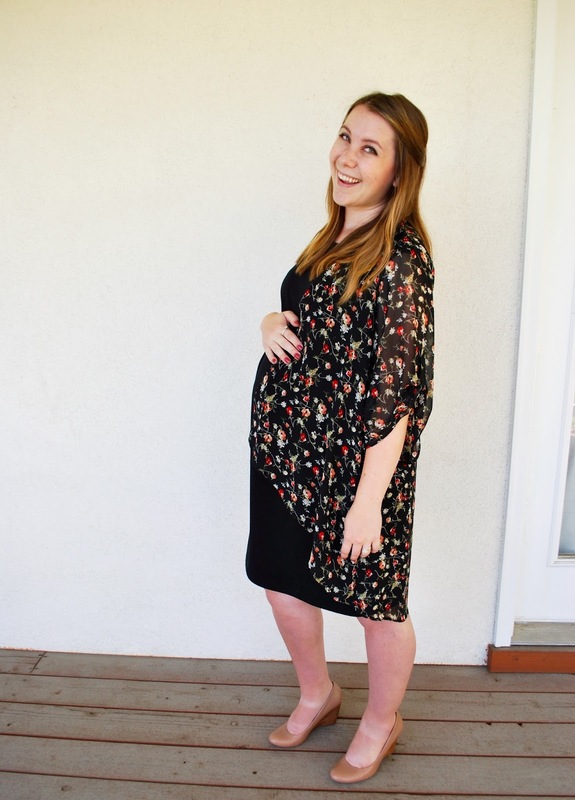 I figured I'd post some pictures of my growing baby bump and give you a story, because that's what this blog is for, right? I would do a pregnancy update, but what's the point? I can just tell you everything is basically the same! Except now I have had an awesome baby shower - thanks mom and mom-in-law - and I have a sweet stroller and stuff. I'm only on the verge of a panic attack when I think of all the other things I need and how I'm going to have a REAL LIFE BABY in under two months. WHAA... breathe, Madeline, breathe. Everything will be fine, right? Still got that darn stuffy nose, but on the bright side I have had absolutely no trouble sleeping. Sleeping is awesome. Maybe it's because of my Snoogle. That's the brand of my body pillow and the word Snoogle never ceases to amuse me. Anyway, story time! 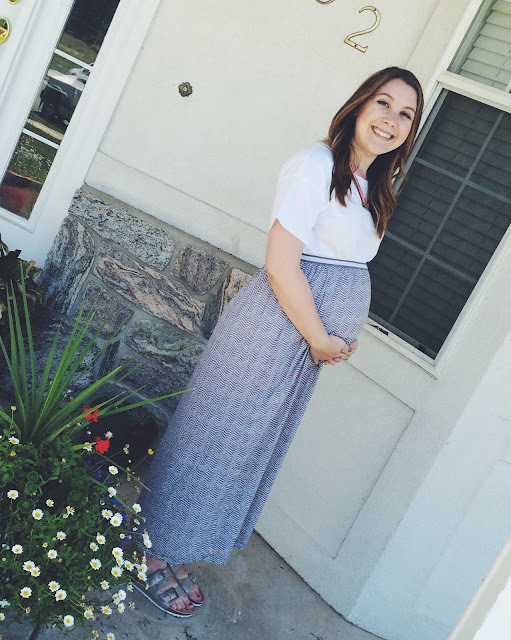 Pregnancy brain story time! Ok, so WAYYYYY back when, I ordered a dress from ASOS. 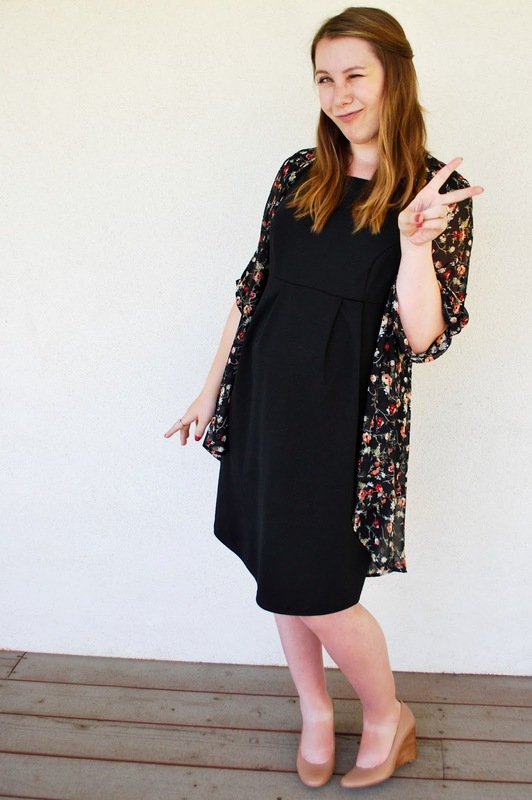 ASOS has the best maternity dresses as far as I am concerned. I feel like for some reason people think that pregnant women need to wear frilly ruffly things all the time? Like we need to be dressed up like presents or something? Gag me. So, ASOS is my jam. Normal clothes with a little more room. Anyway, I ordered this gorgeous dress, and I was super excited about it. This was at the very beginning of July. So I got back from my vacation to Oregon (note to self- blog about Oregon) and the package was not there! I thought for sure it would have been delivered by then. I tracked it online, and it said that it WAS delivered. To Logan. So I was like, that's ok! It will just get forwarded. So I waited a few more days, and nothing was happening. And then I thought to myself, why would they have DELIVERED it if they were going to forward it? That wouldn't happen. So I was perplexed. I actually texted the girl who took our apartment and asked if she had seen a package, and she had not. So I called the post office. The boy I talked to seemed confused. Rightly so! I double checked my confirmation email and saw that the address in Logan the dress was delivered to was the FIRST apartment Alex and I lived in in Logan. Well... I felt sheepish about that. But I asked the post office guy if maybe they could go back to the apartment and get it and then forward it to me? He acted like he would, and said he would give me a call about it. A few days later and still nothing. No call from the post office. Let's be honest, I didn't have my hopes up about that. So, my mom and dad went up to Logan so my dad could get his dream season ticket seats at the stadium, and I asked my mom if she would drop by the apartment and ask for the package. She said she would! When she went, no one answered so she left a note for me asking them to give me a call or forward the package. I waited a couple days and still NOTHING. I am not kidding you, this was the biggest source of stress in my life ha ha. I would wake up in the morning and it was the first thing I thought of! The dress was $55! I don't have $55 to lose, people! Who does, right? I felt really guilty, because we are buying this house, and we need all this baby stuff, and money is tight as is, so it was terrible to me to think that this would be money down the drain! I'm hoping after all this trouble it fits.